Noseslide - A slide with the nose of the skateboard on the edge. To do a noseslide you must put all your weight on the nose and slide. During the ollie you pop from the tail and then shift all you weight to the nose to land on the edge. 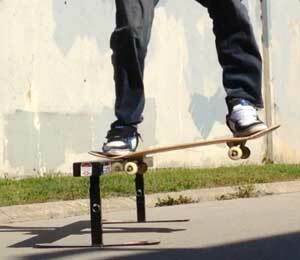 At first it will be helpful not to ollie into this trick and try it into a stall. The weight shift from the tail to the nose is key. It will take time to get this and be able to ollie into a noseslide. Once locked in this is a stable trick. The nose of the skateboard is flat from side to side. Unlike a boardslide where you need to balance on the concave of the deck. You will be doing many of the same things that you learned with the boardslide. The major difference is where you land and how much you need to shift your weight. I will describe the backside noseslide. Where you are looking and sliding forward. The balance and body positioning is much easier than a frontside noseslide. You will land on the nose and slide on the deck, wheels and even some of the truck. The board position is key to letting you slide. The wheels are grippy and if they rub the edge at the wrong angle they will stick. Getting your weight shifted all the way to the nose after an ollie is a challenge. I will describe a slappy version. Where you ride into the trick without popping an ollie. Putting the front foot on the nose before you pop. It makes for a sort of sloppy jump but if you get in and slide it won’t matter. It is helpful to practice a straight on nose stall on a curb before you try and slide it. This gives you the feel. The weight transfer is the trick. Master that and the noseslide will be yours. Roll toward a curb around 4”[100mm] high at 90°. Put your front foot on the nose almost perpendicular to the deck. The inner part of the foot should be at the outer hardware. If you need to get more push from the kick put it even further out. Put your back foot on the tail the same way. When you get close you will lift the front of the board up enough to place it on the edge of the curb. Get the nose up on the curb and you will feel the wheels hit the curb. As soon as the wheels hit you want to shift most of your weight to the nose and lift those back wheels off the ground. You will feel the board kind of rock up onto the nose. You should be standing with almost all weight on the nose. The back foot just holds the board in place. Now lean back onto the back wheels. You can kind of kickturn out of and away from the curb. Roll at the edge around 4”[100mm] high at an angle around 45°. Higher angle, tougher landing, better slide. Put your front foot on the nose almost perpendicular to the deck. The inner part of the foot should be at the outer hardware. When you get close you will pop an ollie. You need to pop up and land with most of your weight on the nose. Land at less than 90° to slide. Under rotating from 90° is the key to sliding and not sticking. To get out of the trick drop your back wheels to the ground. The balance and board control you learn with this trick will pay off on more advanced tricks. Learning how to keep the wheels from sticking by under-rotating is the key. Many other skateboard tricks need this kind of subtlety. It took me years of watching good skaters to notice this technique. Once I tried it sliding tricks became easy. As you get better you can start putting some pop into the tail and getting onto higher things. Do the nose stall a lot before you start trying to slide this trick. That will get your weight and control just right. The more time you learn board control the better off you will be.